, third earl of Cumberland, and father to the preceding, was very eminent for his skill in navigation. He was born at Brougham castle, We*stmoreland, Aug. 8, 1558, and educated at Peterhouse, Cajnbridge, where his tutor was the celebrated John Whitgift^ afterwards archbishop of Canterbury. In this place he applied himself chiefly to the study of the mathematics, to which his genius led him, and by which he became qualified for the several great expeditions he afterwards undertook. 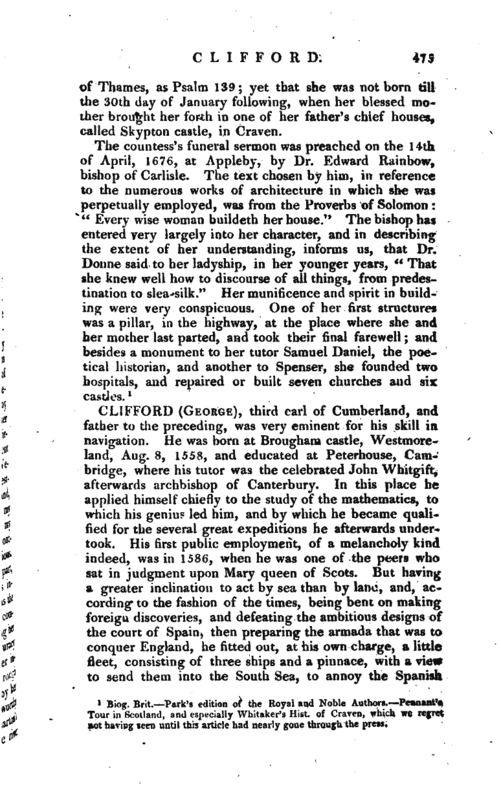 His first public employment, of a melancholy kind indeed, was in 1586, when he was one of the peers who sat in judgment upon Mary queen of Scots. But having a greater inclination to act by sea than by land, and, according to the fashion of the times, being bent on making foreign discoveries, and defeating the ambitious designs of the court of Spain, then preparing the armada that was to conquer England, he fitted out, at his own charge, a little fleet, consisting of three ships and a pinnace, with a view to send them into the South Sea, to annoy the Spanish | settlements there. They sailed from Gravesend, June 26, 1586, and from Plymouth Aug. J7; but were forced back hy contrary winds into Dartmouth, from whence putting out again on the 29th, they fell in with the coast of Barbary the 17th September, and the next day sailed into the road of Santa Cruz. On the 25th they came to the river Oro, just under the northern tropic, where they anchored. Searching upwards the next day, they found that river to be as broad all the way for fourteen or fifteen leagues, as at the mouth, which was two leagues over; but met with no town nor house. On the last of September they departed for Sierra Leone; where they arrived the 2 1st of October, and going on shore, they burned a town of the negroes, and brought away to their ships about fifteen tons of rice; and having furnished themselves with wood and water, they sailed the 2 1st of November from Sierra Leone, making the straights of Magellan. The 2d of January 1587 they discovered land; and on the 4th of that month fell in with the American shore, in 30 deg. 40 min. south lat. Continuing their course southward, they took, January 10, not far from the river of Plata, a small Portuguese ship; and the next day another; out of which they furnished themselves with what necessaries they wanted. The 12th of January they came to Seal Island, and two days after to the Green Island, near which they took in water. 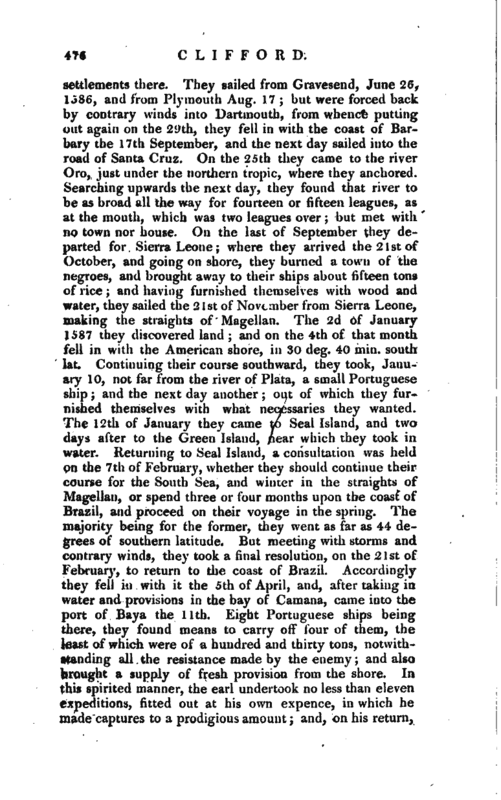 Returning to Seal Island, a consultation was held on the 7th of February, whether they should continue their course for the South Sea, and winter in the straights of Magellan, or spend three or four months upon the coast of Brazil, and proceed on their voyage in the spring. The majority being for the former, they went as far as 44 degrees of southern latitude. But meeting with storms and contrary winds, they took a final resolution, on the 21st of February, to return to the coast of Brazil. Accordingly they fell in with it the 5th of April, and, after taking in water and provisions in the bay of Camana, came into the port of Baya the llth. Eight Portuguese ships being there, they found means to carry off four of them, the least of which were of a hundred and thirty tons, notwithstanding all the resistance made by the enemy; and also brought a supply of fresh provision from the shore. In this spirited manner, the earl undertook no less than eleven expeditions, fitted out at his own expence, in which he made captures to a prodigious amount 5 and, on his return, | was graciously received by his royal mistress, who created him knight of the garter in 1591. In 1601 he was one of the lords that were sent with forces to reduce the earl of Essex to obedience. He departed this life at the Savoy in London, Oct. 30, 1605, and was buried at Skipton, in Yorkshire, the 30th of March following; where a fine toinb was afterwards erected to his memory. Biog. Brit. Park’s edit, of the Hoyal and Nob!e Authors. 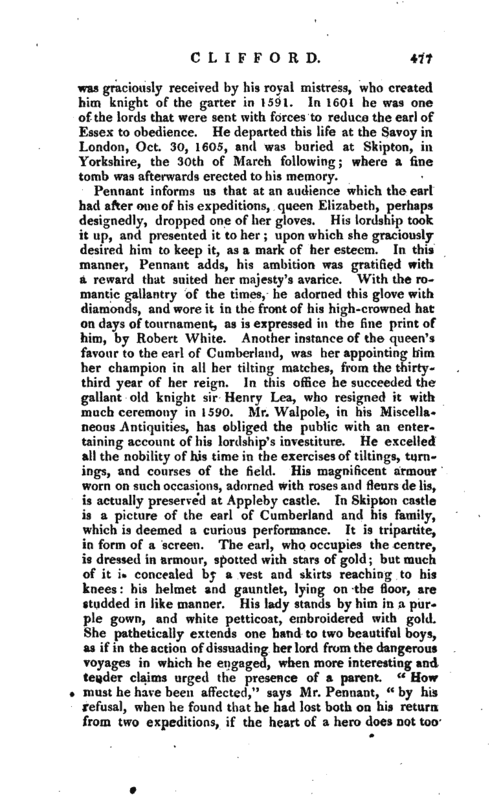 Pennant’s Tour in Scotland. 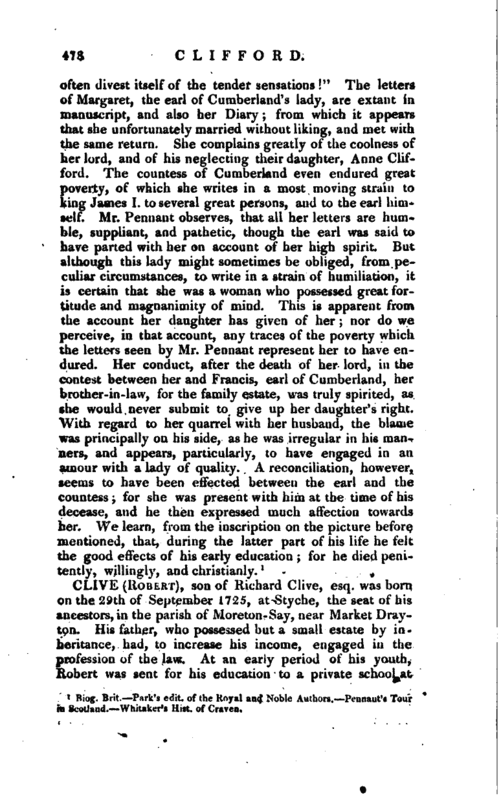 Whitaker’s Hist, of Craven.